I always find it amazing when artwork survives for hundreds of years after it was created; particularly work done on paper. This work Judith and Holofernes dates back to 1645 when it was engraved by Abraham Bosse (1602-1676). The work measures 6 15/16 x 4 7/16 inches. It is one of several etchings done by Bosse on this subject though it is perhaps the most well-known. 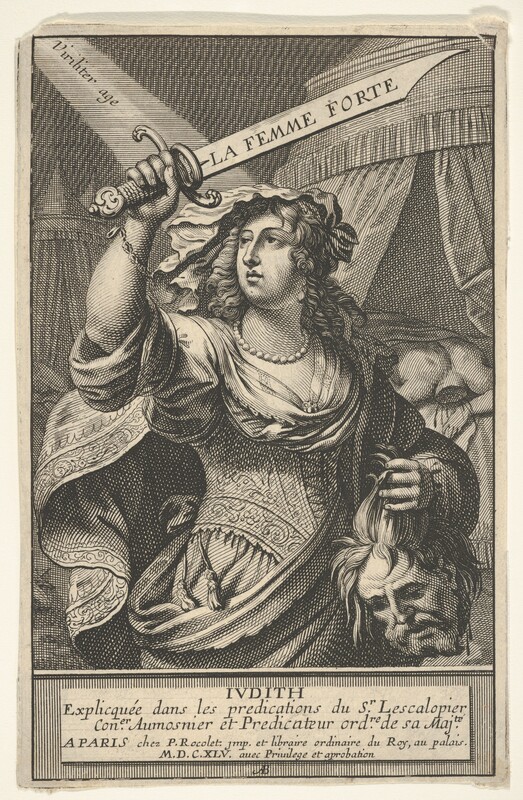 So, who were Judith and Holofernes? The Judith in question is the subject of the deuterocanonical Book of Judith. Judith is a beautiful widow. She lived in the city of Behulia which was under attack by the Assyrians. Nebuchadnezzar, the Assyrian king, dispatched Holofernes to take vengeance on the nations of the west that had withheld their assistance to his reign. When Holofernes had blocked the city’s water supply, its leaders were prepared to surrender. Judith entered the enemy camp and seduced the general. After getting him drunk, she killed him while he laid in his own bed. She returned to Bethulia with the severed head. Her bravery inspired the town and they were able to defeat the enemy. There have been numerous paintings of Judith and Holofernes. She is often depicted as a virtuous woman of great strength and bravery. Some versions include a maidservant. Some have her carrying the head in a basket and others, such as this one by Bosse, clearly show her carrying the head in her bare hands. As he did with many of his works, Bosse took a Biblical story and depicted it in a modern setting. The clothing worn by Judith is more in keeping of what wealthy women of his era would wear. Even if we didn’t know from the Book of Judith that she was a wealthy widow, Bosse’s depiction of her leaves no doubt. I always am in awe to think before there were sewing machines and fabric stores, there were seamstresses and tailors making garments this elaborate. Embroidery on her vest, layers of ruffles, tassels and maybe even some beading all adorn her dress. Bosse’s Judith is a regal lady with a heart of steel. Her sword is emblazed with La Femme Forte. Clearly, this is a strong woman. Yet, her curled hair, beaded necklace and gold bracelet (somehow we know it must be gold even though it is not gilded) show her feminine side.